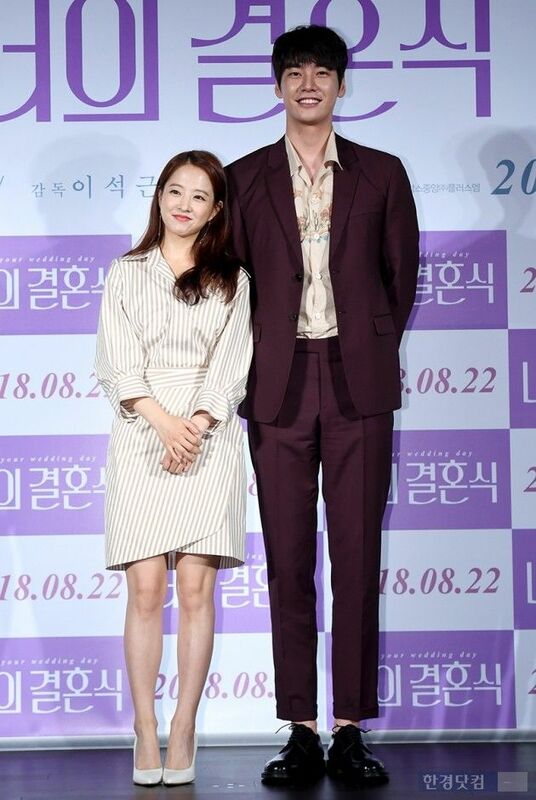 Lovers of shoujo manga will really get a kick out of seeing Park Bo Young and Kim Young Kwang at the press conference for this upcoming rom-com film On Your Wedding Day. He is easily two feet taller than her and their chemistry is straight out of shouja manga he looks down adoringly and she gazes at him sweetly type. The movie is the typical coming-of-age tale where the leads go to high school together but never fully realize the extent of their feelings until later when as adults they may have other paths ahead romantically. It looks cute enough but I’m satisfied just by their press con pictures being such a manga treat. They look all kinds of adorable but I still have an aversion to him after his comments about not even wanting to look at anyone (that he perceives as being) ugly, hating thick calves, and anyone that looks pathetic. LOOOOOL Thats all I think about whenever I look at him. Yeah, I agree.This is why I cant warm up to him fully.The irony being that he only has his model height and good body proportions but his face is so-so.I remember watching him in “Good Doctor” and I was like who is this handsome guy?He had the same charm as Lee Seung Gi when I saw him.But after I read that, thats when my perception changed.He didnt even say that only one time.He said similar things on other occasions so no, it wasnt just a misspoke or misunderstanding. I mean he can think whatever he wants and I can understand because he is a model and his workplace is surrounded by attractive people. But sometimes its good to keep such thoughts to yourself especially when you are a public figure. Nevertheless, these two look adorable together.Its refreshing too to see cute romance k-movies.Their movie industry is oversaturated with action and sageuk genre.They need to release more melos, comedies and romance movies. That’s a huge reason why I find him unappealing. He seems super calculative too. Oh, my bad! Very sorry Kim wobin! It’s good that we’re entering a period of re-casting because I’d love to see them in a drama together. Park Bo Young is just a bundle of cuteness.I love her so much.I need her in something like “Oh my Ghostess” again.Strong Woman Do Bong Soon didnt do it for me.But then again she is losing nothing by staying in chungmuro.Dramaland has very limited roles for actresses.She gets to do more meaty, more interesting and diverse roles in movies.But still I miss seeing her for long periods of time on tv. I like Park Bo Young. She is very talented. But she has been staying with rom-com for far too long and been playing quite a number cutesy roles. It’s like her comfort zone already. It would be nice to watch her in meatier roles. I am ok with typecasting for actors(whether it be the roles or the genre) if I can still feel that they are bringing something new to the table from one drama/movie to the next.It works for others and it doesnt for others. For example, Hwang Jung Eum’s style in rom com has worn thin now because her way of interpreting her characters from one rom com drama to the next is the same.For Park Bo Young, she still has more to offer.I mean if she gets offers or roles in other genres which make her revamp her acting style.Its alright too. agree with @RubyRed that PBY has the potential to take various roles in her career. She still looks fresh to me dressed in high school uniform in rom-com so I will continue to enjoy her performance in such. I am sure she will be in other movie genres when the time comes, maybe after 30 when she no longer wants to act in school uniform? On the other hand, I have totally tuned out of HJE after She is Pretty, her style is very outdated and her face looks weird (my opinion). Didn’t they act together in Hot Young Blood? If I’m not wrong, KYW’s character fell in love with PBY’s character, but he didn’t get the girl. They were in high school then too. So it looks like he’ll get her second time round. I didn’t recognized her due to her long hair. I personally lover her with shorter hair and will look forward to her next tv drama. Swdbs drama sucked. Too bad for her. But her Oh My Ghost was great. Is it true that park bo young is lee seung hoon ex gf ?? 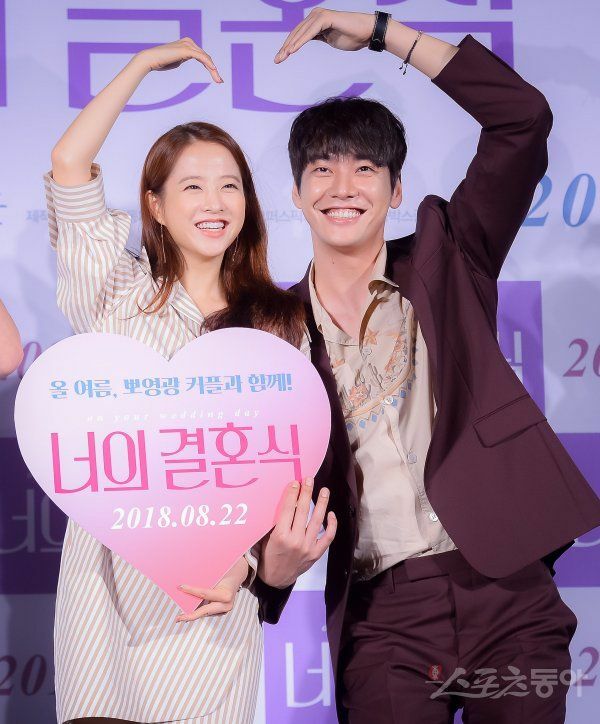 Does anyone know the brand of the shirt Kim Young Kwang is wearing?